Yes, it's Saturday, the day to celebrate all things Pink and wonderful! Thanks to Beverly for hosting this fun event each week! I just love getting a surprise present, don't you? My friend, Carolyn, gave me this lovely gift...."just because". We work together on a newsletter for our ladies group, and she does the fabulous photography for it, which is a lot of work, and I do the articles and layout. She said she just wanted to thank me for the work that I do. Well, she does a lot of work too!! 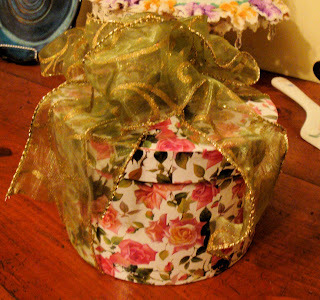 I was just giddy with excitement at this beautifully wrapped gift, I couldn't wait to open it! Isn't it pretty? And...it's PINK, how perfect to share it with you on this PINK day! 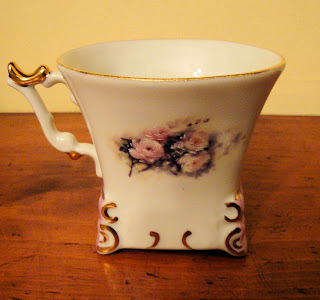 The cup has a square bottom, that I just love. 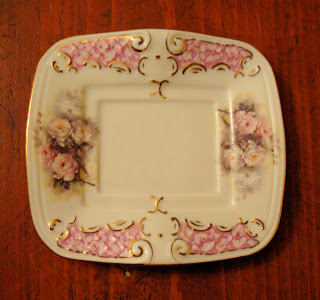 And the saucer is square to match. 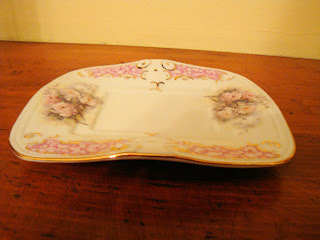 Here is the side view, showing the wonderful shape of this dish. The most special part of all is the thought of course. You see, Carolyn has been to my house. 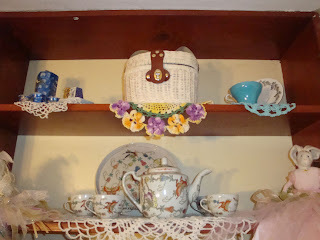 So she has seen all of my teapots and teacups. This gift says "I know you", and that is the best kind. Hmmmm. My turn, don't you think? Yes, she deserves a gift too! I have a few ideas...we shall see...I'll keep you posted! 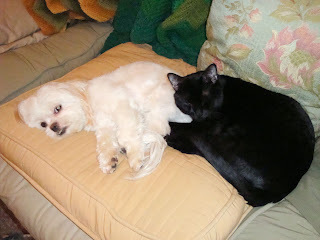 Wow...it's been almost a week since I have posted to my blog. And, I haven't been to visit my favorite blogs either! I have missed them all so much. It just shows how attached I am to blogland! My Granddaughters came to visit. It was a day to get them here and a day back and two ENTIRE days to spend with them. We sure did cram in a lot in those two days, seemed like a week. We went to tea, it's a given. They KNOW that a visit to Grammy's house will include going to the Tea House. 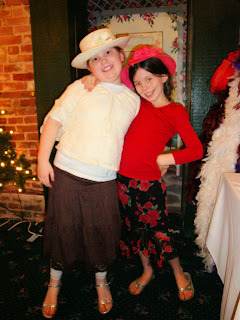 They were perfect little ladies!! 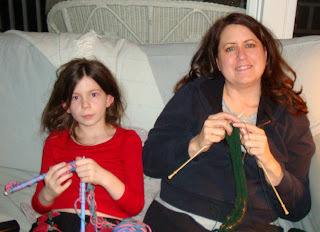 I remember the first time I tried to teach them to crochet, it was a disaster! Knots and yarn everywhere. I thought if I never mentioned it again, that they would forget. Well, they didn't. They asked and asked about it. Then one day, I was reading an article in a knitting magazine. The article was all about a knitting designer, she was telling her "story". 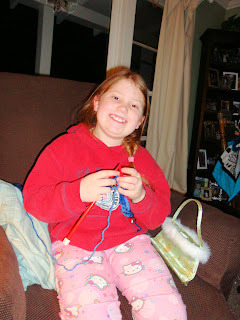 Somewhere in the story, she said that her Grandmother taught her to knit when she was 8. When I read that, it brought tears to my eyes. 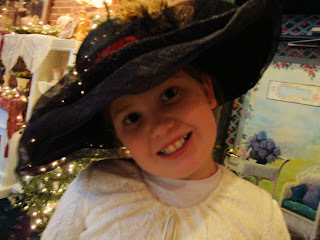 At that time, my oldest grandaughter was 8!! I went to the store and bought them both knitting needles and yarn and on our next visit, I taught them to knit. Sure, there were knots and holes and there was also FUN! I told them it didn't have to be perfect. If they had mistakes, we called that "art". So, of course, I told them to bring their knitting with them. Each time we knit together, they get better at it. And, I KNOW that we are creating special memories! They spent time at Auntie's house, rocking out to Rock Band and eating Macaroni and Cheese. We went to lunch with their Great Grandmother, my mother in law. 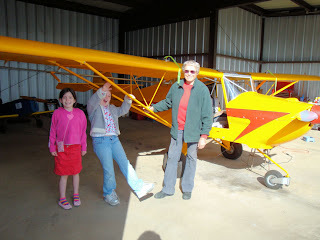 She showed them her airplane. This lady built this airplane her self. She had some help when needed, but it's all hers!! And, she loves to fly it. She will be 80 in a few weeks. What an inspiration!! The girls loved it!! I planned for them to do a craft while they were here and it was a HUGE success, so I will share it with you. I let them use my camera to take all the "memory" pictures that they wanted. I would say to them, "each of you may take 5 pictures", etc. I had to put a number on it or it would take forever. So, each time we did something, like the Tea House or visiting Aunties, they took pictures. 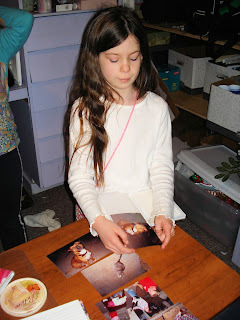 Those pictures were like a little window in to their brains! It was amazing to see what was important to them. 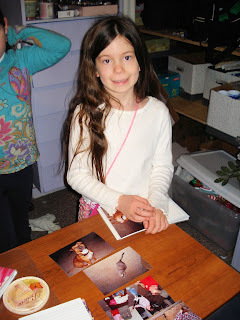 We organized their pics into folders and then they chose a few to put in a "memory book". We just bought a couple of very small photo albums at Walmart for a dollar. 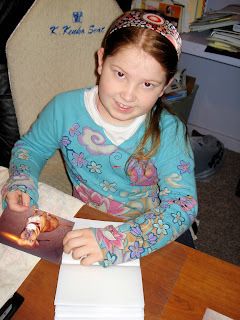 Then I bought them some stickers and on the long drive home they decorated their memory books. Those books turned out so precious! And now, if they start to miss Grammy and Grandpa, they can look at their memory book and remember their fun trip! I had a wonderful time, I'm still exhausted, and I am enjoying my quiet house again. 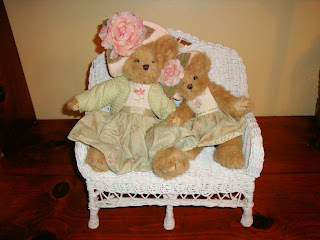 I have to go look for something pink for tomorrows Pink Saturday.....see you then! I'm so excited!! Guess who is coming to visit?? Here is a clue. Any ideas? Hmmmm. What's inside the basket? 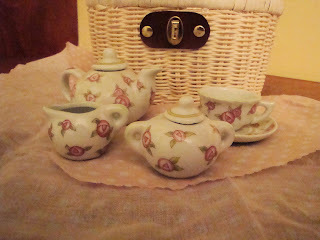 An adorable miniature tea set...PINK of course!! 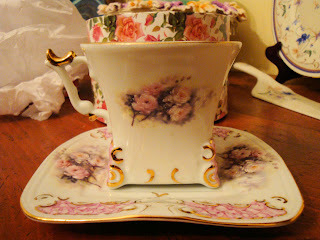 The two persons who are coming to visit me, well they LOVE this tea set! 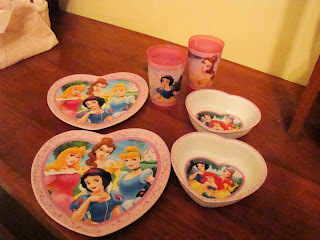 And, I keep these dishes on hand.....just for them....PINK, of course! Have you guessed? Yep, my precious granddaughters are coming to visit this weekend. I was on the phone with my son and he told me that my granddaughter was sad, and missing us. Wow. It's hard to believe that "I" am anyone's grandmother. AND, that she even thinks about me when I'm not there, let alone to actually MISS me. I KNOW that I miss them....SO much! So, I told him that we could meet half way....well to be fair, he will drive for 3 1/2 hours and we will drive for 5 (and that is ONE WAY, we pick them up and turn around for another 5! ), but it seems like the best meeting point...I digress, he said sure, and just like that a surprise visit was set in to motion! 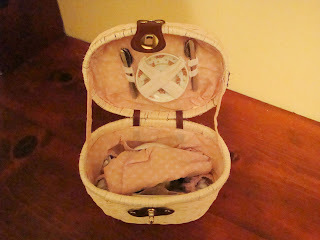 Do you other grandmas keep special things for your little ones? I still have to go get their toys out of the closet. They think that I keep them sitting in my living room all the time. Don't tell them, okay? 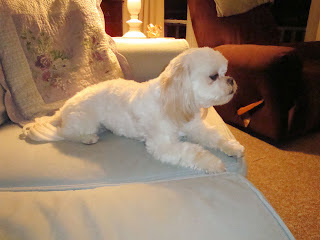 Even Pookie got an emergency hair cut for the occasion. He was just TOO tired to pose. Go ahead and sleep then. He has no idea what is coming his way.....I think he'd better rest up!! I love this blogging world. It's just wonderful to be able to reach out in to the world and meet people without even leaving the house. I like to leave the house every once in a while mind you, but the blogging world is easy to sort of "filter" and find people with similar interests and I enjoy reading all about them and their own world. With that in mind, I have 2 things to share right now. One is that I have been "tagged" by Syndee to share 8 random things about myself. I did this before and I'm not even going to look at it...hope I don't duplicate! 1. I love music. 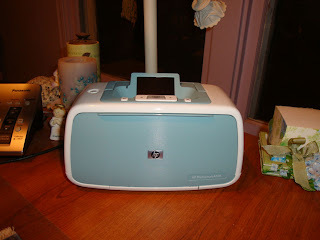 I have an Ipod and I love to listen to it in the car, while I'm sewing, on my treadmill. Can't get enough! 2. I love gadgets. I am always after something new to add to my collection (hence my new photo printer). My cell phone is also a PDA. 3. I love to take pictures. I'm married to a wonderful photographer, so I have been reluctant to take photos myself. I'm older now and I don't care as much what anyone else thinks, so I am now taking pictures and he is enjoying sharing his vast knowledge with me....in limited terms of course. 4. I prefer winter over summer. I'm starting to think that will change because I love the new deck so much, I'm already wishing for summer. 5. I hate to fly. I won't avoid it, I just don't like it. 6. I don't like crowds. I won't go to the movies on a weekend, I stay away from things with lots of people if I can. 7. My favorite color is blue/green. 8. I don't wear rings. They bug me. I'm always taking my wedding ring off and forgetting where I left it. Just for the record, I AM married (happily), so if you see me without my ring, it just means I was doing dishes, or knitting or typing, that's all! Whew! There. I did it. Now it's your turn. I'm supposed to tag some other lucky folks to share 8 Random things too. All you need to do, is post your 8 things and link back to me on the post. Then leave me a comment so I can read ALL about you! 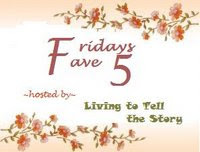 Another thing I came across is Favorite Five on Friday. I love this idea. 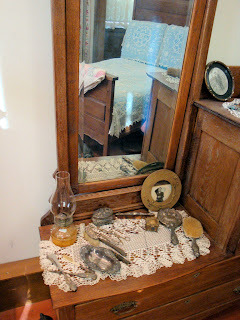 If you would like to know more visit : http://susannesspace.blogspot.com/2009/01/fridays-fave-five-21.html and you will see all about it. I try to take time every day, just before I go to sleep to be thankful for things that happened throughout the day. I love Susanne's idea, because it's a way to reflect over the week and be thankful for just 5 favorite things. 1. Hair Day on Thursday. I LOVE hair day. I have been going to the same person for a really long time. It's such a treat. Don't you just love having your hair washed and fixed? 2. 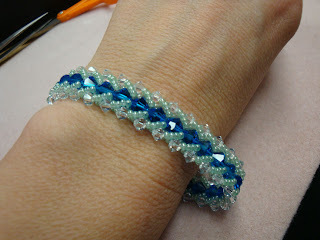 Beading club on Tuesday. 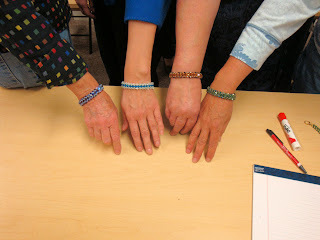 I love my new bracelet and I enjoyed the fun ladies in the group! 3. Yesterday my son and I cooked up a plan to have my granddaughters come for a quick visit this weekend. They miss us and we miss them. I can't wait!! 4. Thrift Stores. I've really been making the rounds this week. Haven't found anything to shout about, but I SO enjoy the hunt! 5. Rain. I'd rather not go out in it, but I DO love the rain. I love the sound, I love the smell, I love how it washes everything clean. We needed it so bad. What are your favorite 5 things from this week? Take a minute to go to Susanne's and join in the fun, I look forward to seeing what you put down! What is ASG? It's the American Sewing Guild. I just joined a few months ago, and I love it. They have Neighborhood Groups and each group has a different focus. This group is all about beading. It's once per month and each time, we learn something new. This time we learned how to make a flat spiral bracelet. It was very simple and the results are stunning. These are just a few of us showing off our results. I guess that crystals don't like having their picture taken, because it's much more sparkly than this photo implies. I made my bracelet just a little too big. It will just have to "do". 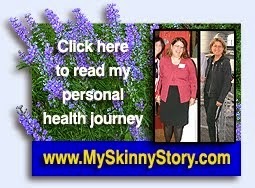 I was on one of the blogs that I follow click here to see (I think that the "following" feature is so handy! ), and she was doing a project, I think it was called 365. Anyway, the idea is to take a picture every day for 365 days and put them in a journal or album. I LOVE that idea. 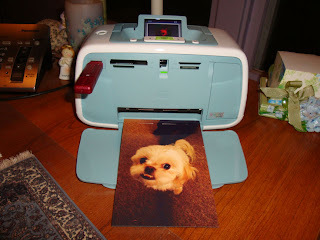 I told hubby that I NEEDED a photo printer. He told me that prints are really inexpensive at Walmart. Well, not when you figure that it would take me a half an hour to get there! I bought it at Walmart (imagine that!). I will warn you that the ink cost more than the printer. It's a trick. They practically give you the printer so you will be hooked in to buying ink!! I tried it out and it makes great photos. The 365 project? I'll get to that, it's on my "list" of things to do!! I've had good purchases from Ebay and then I've had mistake purchases. 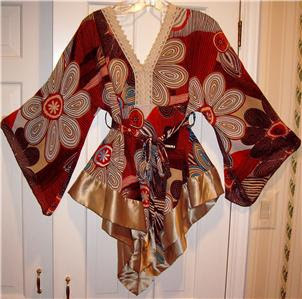 I was looking for ideas for blouses, more for sewing than for buying, and I just HAD to have this top. I don't own anything like it (that was a clue), I wasn't sure I would like the colors (another clue), but isn't it so pretty? In my defense, it was brand new and didn't cost much, and the shipping was free. Well, I don't think I will ever actually wear it. It's kind of big, and it reminds me of maternity clothes. 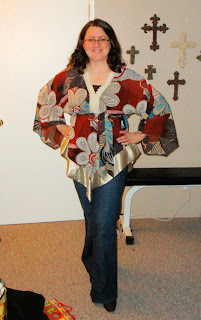 Do you remember when maternity clothes were loose fitting, empire waist? 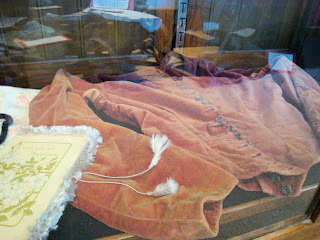 Not the tight T-shirts they wear these days. And, it's not "my color". Do you remember Color Analysis? I used to do that, I still think it's helpful to follow, I just can't wear tan and burnt orange. Darn it. I guess I'll show it to my daughter, maybe she will like it. It's a Beary good time to check out some Pink! They came with names, but I guess I took off the tags and now, I don't remember. I've always imagined them to be Mother and Daughter. I went to the Bearington website to see if I could find them, and this turned out to be a very dangerous thing to do...I could have bought every single one of them!! 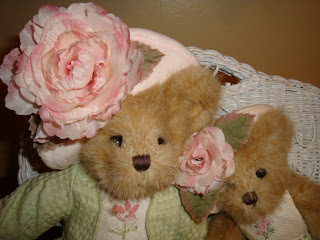 Pretty little pink hats with matching pink flowers. Don't they look so cuddly? I thought that they would look perfect with my wicker on my porch. But, alas, they would not be safe there. The dogs (and cats) would thank me for the new toys! I'm hoping to screen it in this summer, and then they will have the place to themselves. 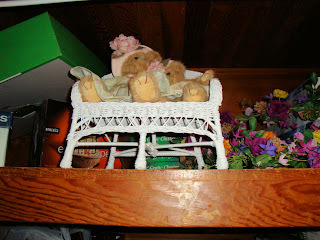 For now, they are hiding in the top of a closet. It feels like a crime to keep them out of site. rush on over to Beverly's and cheer yourself up with miles and miles of PINK! One of the things that I do, is work with my husband in our advertising business. It is so interesting how many different things we get to learn about because of our business. Right now we are working on a story to be published inside a phone book. The proposed topic is local museums. 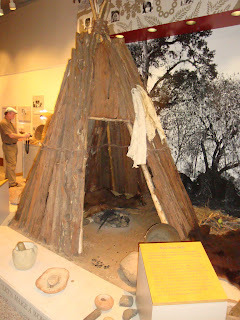 That means that we are visiting each museum in the area as research. Hubby takes photos and I will write the story. I've lived here for over 20 years, and I have not visited these places, ever. Wow. Was I missing out!! We live in the Gold Rush area. It was a unique time in history. 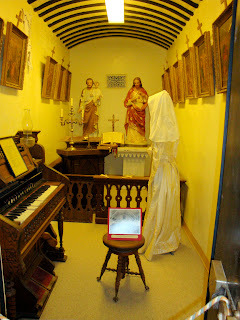 If you like history, you might enjoy my little tour of the Museum in San Andreas California. If you are reading this, you are sitting at a computer. 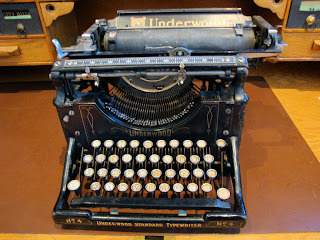 And, as your fingers fly across the keyboard, consider what it would be like if this early typewriter was the LATEST technology. This would be your office if you had a professional job. It's the Judge's office next to the Courtroom. 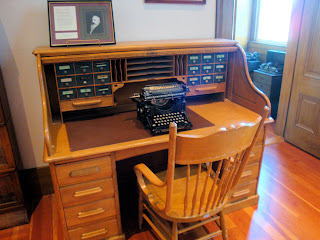 Imagine typing documents all day on this!! Let's take a look at home life. When you got up this morning, you most likely had a regular routine. Get up, get dressed, fix something to eat....check email!! 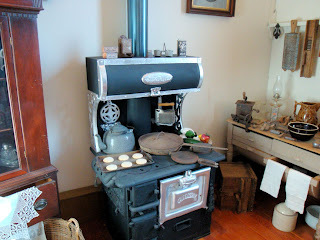 What if you had to get up and light the stove before you could even think about having coffee or tea! You would probably get up way before everyone else, so you could start fixing breakfast! What are you wearing right now? Something comfy? I'm in a sweatsuit...it's my uniform!! Look at the average outfit here. Brown dress (drab), probably the same one most days. And, doesn't look comfy!! And, the table is all set for breakfast. You would have baked the bread and biscuits, yourself! And... you would have churned the butter yourself. These days the discussion is about margarine vs butter, or maybe a butter "substitute". 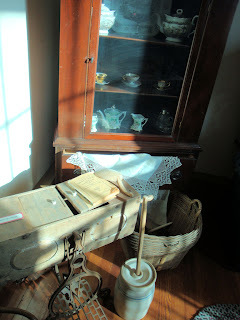 In these old times, you would be talking about whether to use the standing butter churn or the newer foot pedal model. 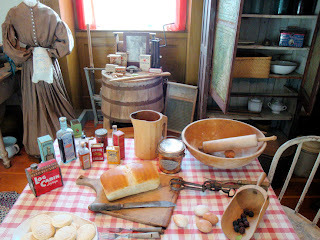 Why was butter churning such a big deal? 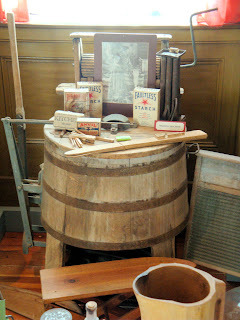 This is the washing machine (center-the barrell). Is it wash day? Want to do a quick load? Looks like an all day chore if you ask me!! 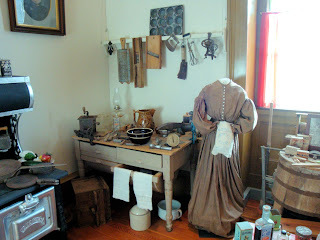 I like to straighten and clean up the kitchen in the morning. Look at this kitchen. Wow. it's small! Where are all the appliances? What did your kids wear to school today? This child's outfit was so lovingly made. Look at the tiny shoes!! How often did this kid wear this dress up suit? Look at his toys below. Probably didn't have a lot of toys. Certainly nothing like video games!! He probably started doing chores, and lot's of them at a very early age! When was the last time you moved. Were you amazed by the sheer amount of stuff you own? Back in these olden days, people didn't have much. So, what they had held more importance and value. A mirror, a comb, a brush....no hair dryer, straightener, electric curlers. I read that they didn't shampoo their hair often, maybe once a week or even once a month! That's why the 100 brush strokes, to kind of clean your hair and distribute the oils. I wonder if it was itchy? I love the decorating blogs so much. I find decorating to be very fun! Back then, decor was minimal. Everything you had, was made by you or someone close to you. This lace bed set was probably a prized possesion. 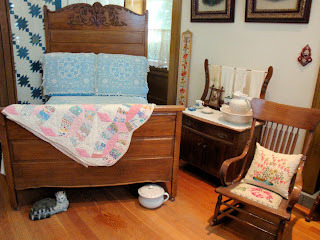 And, of course the quilts...not just for art...so comfy and warm!! 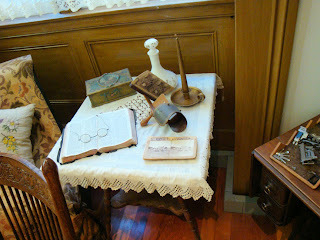 Do you think it would be YOUR job to empty the chamber pot? Ugh. What? No TV? No American Idol? What the heck would we do with ourselves? Talk? Read? Sing and play music. Probably just sleep. We would all be so tired from all the hard work all day!! This is from a church that was demolished to make way for a dam. I imagine that Church was the center of one's social life as well as spiritual life. I love clothes and fashion. I could buy new clothes everyday!! I also like to make clothes, but I hardly am ever satisfied with the results. I'm sure some people could buy ready made or tailored clothing, but most people made their own. This jacket....all those buttons! What a lot of work. Wouldn't they love a zipper? 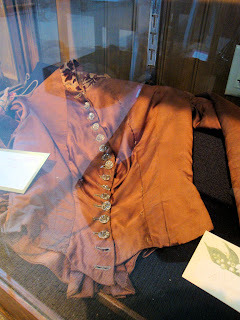 When you look at these clothes, the people were most certainly smaller. Positively TINY! Was it all the labor? Or are we just evolving into bigger humans? 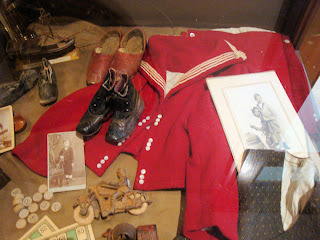 Even the feet/shoes were teeny tiny! I love to bead. It's a hobby. 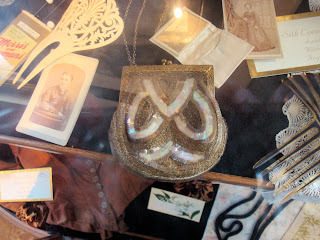 This purse would have take me forever, IF I could have done it at all. That would have been a highly valuable possession. Need a new rug? Run to Target. 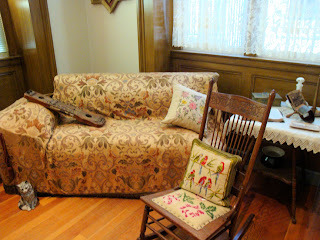 Or sit at this loom and make one yourself!! This sewing machine sews one direction. 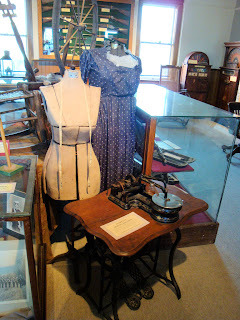 Compared to sewing EVERYTHING by hand, it was a marvelous invention. 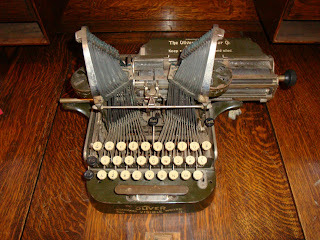 Compare this to the latest high tech machines of today... wow! Got Yarn? Are you a knitter? Do you enjoy yarn shopping? Looking through rows and rows of colorful choices? 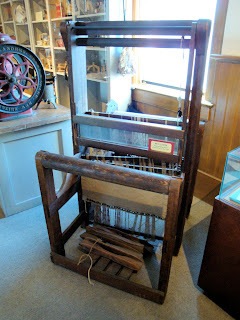 What if you had to use this to get yarn? Nice for a hobby, but I would want to HAVE to! 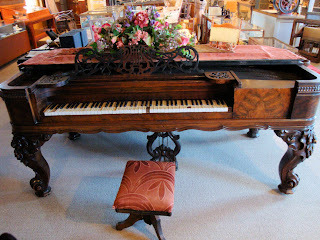 This piano was either a prized possession or belonged to a wealthy family. So ornate! Taking a trip? What to bring? My suitcases are so wonderful. 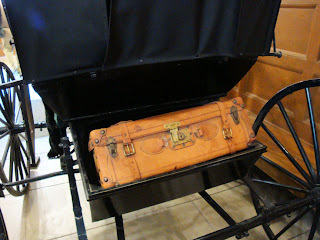 Loads of compartments, zippers, handles, rolling wheels. Take a look at these. Of course, you wouldn't have all that much to bring, would you? 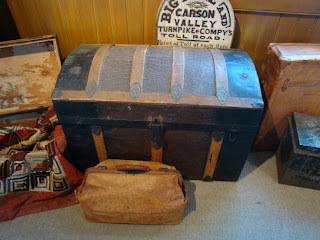 For and extended trip or moving, you would need a trunk! 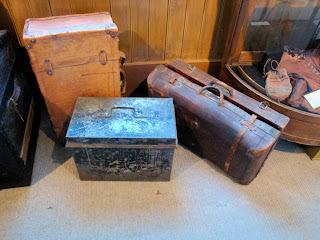 Some people, maybe MOST people, could pack ALL their belongings in one of these! Or you could copy the neighbors and go for a really simple lifestyle. 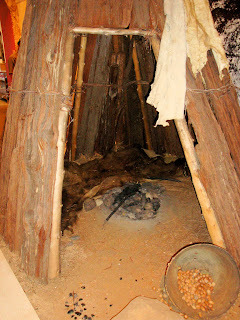 This is a miwok home. 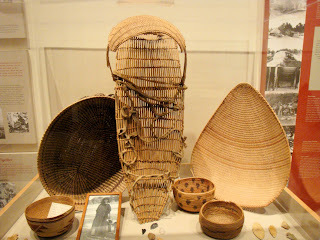 These are some baskets. The center piece is a baby carrier. Wow, these days a baby requires SO much stuff. This is all the indian woman needed for her baby. They strapped the baby in and carried him/her on their back and went on with life as usual. The baby was supposed to learn from being confined, to observe and behave with control. 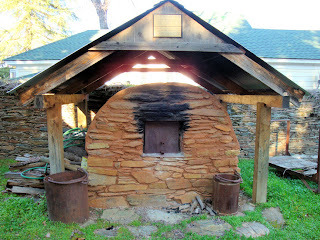 For BIG time baking, this brick oven was used. Looks like a lot of work. Hope it tastes really good!! Pizza anyone? 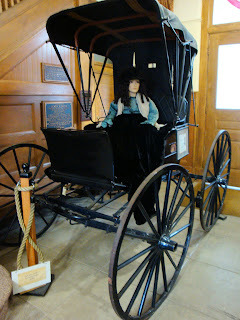 If you had any time left over, you might hitch up your pony cart and visit a neighbor. It had a small place for storage in the back. 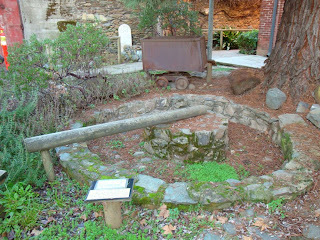 This is a little example of ways that gold was mined. They would have a donkey attached to this and have it walk around and around crushing rocks to be examined for gold. I hope you enjoyed your little trip back in time. I hope that sometime today, you reflect on the magical wonders of modern times and modern technology. 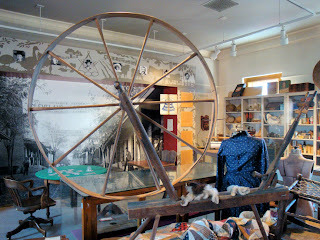 And, if you haven't visited your local museums, take the time to go take a look, it's fascinating!! My Beaded Scarf is done! !